Some of McDaniel's players have taken to kneeling during the national anthem at the start of football games. Photo by Chloe Thompson. In sticking with American tradition, recent months have seen many people across the country taking a stand for what they believe in. 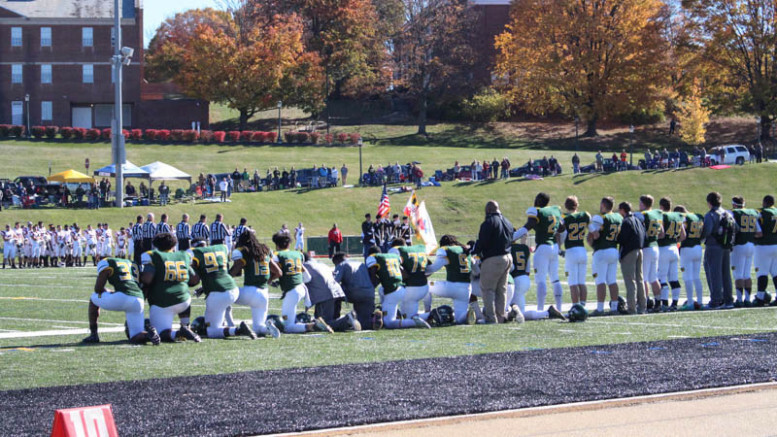 Most recently, that stand has taken center stage at McDaniel College when eight football players started kneeling during the National Anthem, causing controversy among the community. Although McDaniel’s football season has winded down with conference honors being handed out this week, the topic still remains at the heart of many conversations. Kneeling while the National Anthem plays at the start of athletic events came under national review earlier this year when San Francisco 49ers quarterback Colin Kaepernick took a knee at the start of a preseason game, sparking outrage. Shane Douglass, Duane Lucas, Michael Wright, Xavier Brooks, Anthony Crawley Jr., Garvin Brooms, Malik Shockley, and Aris Mayfield, all members of McDaniel’s football team, started kneeling during the anthem this fall. Like Kaepernick, these eight are kneeling to help start the conversation for change. They are tired of hearing about all of the unnecessary killings. Lucas said he is kneeling in solidarity as he to help bring a racial discussion into light. “I think it is important for progress in society,” the senior stated. McDaniel’s eight think that many people are missing the point of the protest and wish that more would look at things from their perspective and social reality. “I realize the nation is divided and this is my way [to protest],” said Shockley. He is hoping for equality for all and thinks that this protest is baby steps that can bring change. Many people, however, think that kneeling during the National Anthem is disrespecting the flag, the country, and its veterans. Wright and Douglass both served in the military and think otherwise. “The military fought for these rights, the freedom to protest and freedom of speech,” said Wright, “It is the National Anthem, not the military anthem. The flag doesn’t just represent the military, it represents this country, the people who fought for this country, as well as the racism and discrimination that have been going on,” the veteran continued. Douglass agreed with Wright, saying that this was his form of a silent protest. All eight players want the issue of police brutality to be addressed more than it is and for people to be held accountable. The fight against police brutality is not new, dating back to part of the Civil Rights Movement. It has been over fifty years since then, but the events that shocked the nation in Ferguson and Baltimore, among other cities, cannot be looked at face value. “[This is a] modern day Civil Rights Movement,” said Brooks. The junior first kneeled in solidarity with Kaepernick, but then started to do his own research about the anthem, particularly the third stanza, and feels that it isn’t right. Mayfield, the only first-year student taking part in the protest, is doing so to get his point across. “Black lives matter and if all lives matter then black lives matter as well,” Mayfield added to the conversation. “I want to challenge people, respectfully ask why we’re doing things, and talk to us rather than just jump on social media,” Wright concluded. Brooks, Crawley Jr., Brooms, Shockley, and Mayfield have all said that they will be kneeling next season.